University of Tsukuba Sub-Program/Component Improvement of Urban Environment Policy University University of Tsukuba (National) 1 Graduate School URL of University URL of Graduate School Program name URL of Program/ Course Degrees Credit and years needed for graduation Graduate School of Life and Environmental Sciences http://www.tsukuba.ac.jp/english/ http://www.life.tsukuba.ac.jp/en/index.html Master’s Program in Environmental Sciences http://www.envr.tsukuba.ac.jp/eng/index.html Master of Environmental Sciences 30 Credits 2 Years 2.Features of University 2.1 History and unique features of the University The University of Tsukuba was established in October 1973 as the first comprehensive university in Japan to be operated under the central government’s nation-wide university reform policy. The University has emphasized openness, innovative systems for education and research, and new university self-governance in undertaking the reform policy. Through its unique curriculum and research incentives, it has cultivated many students and scholars with advanced and creative knowledge that contributed to the good of the public as well as its excellence in research and education. The size of the University has expanded since its foundation and, as of April 2011, 9,954 undergraduate students and 6,843 graduate students are studying in degree programs. Among them were 1,664 international students from 86 countries.  The total number of university staff, including faculty members, is 4,445. The concept of university reform still plays a major role in our continuing effort for improvement. We have always strived to be a unique, active, and internationally competitive university with superlative education and research facilities. 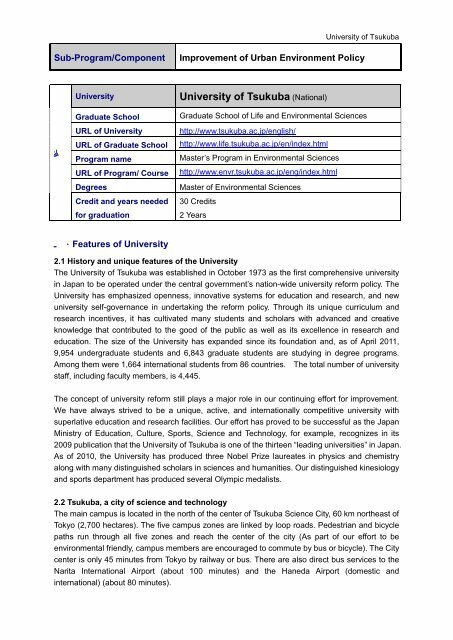 Our effort has proved to be successful as the Japan Ministry of Education, Culture, Sports, Science and Technology, for example, recognizes in its 2009 publication that the University of Tsukuba is one of the thirteen “leading universities” in Japan. As of 2010, the University has produced three Nobel Prize laureates in physics and chemistry along with many distinguished scholars in sciences and humanities. Our distinguished kinesiology and sports department has produced several Olympic medalists. 2.2 Tsukuba, a city of science and technology The main campus is located in the north of the center of Tsukuba Science City, 60 km northeast of Tokyo (2,700 hectares). The five campus zones are linked by loop roads. Pedestrian and bicycle paths run through all five zones and reach the center of the city (As part of our effort to be environmental friendly, campus members are encouraged to commute by bus or bicycle). The City center is only 45 minutes from Tokyo by railway or bus. There are also direct bus services to the Narita International Airport (about 100 minutes) and the Haneda Airport (domestic and international) (about 80 minutes).